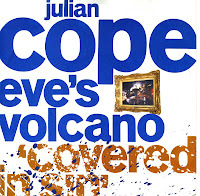 'Eve's volcano' was taken from Julian Cope's 1987 album 'Saint Julian', which also included the hit singles 'World shut your mouth' and 'Trampolene'. After the top 40 success in the UK of these two singles, 'Eve's volcano' did less well by comparison, only reaching no. 41. Still, I loved this single, which was played a lot on Dutch radio at the time. I bought the single soon after it came out. During that year's holiday in London, this was also the first cd-single I ever bought.